The ACS-181 is part of Com-Power's series of broadband RF amplifiers; diverse in application, yet specifically geared for use in EMC immunity testing applications. The ACS-181 model was engineered to provide high gain, with excellent efficiency and reliability, at an unbeatable price. 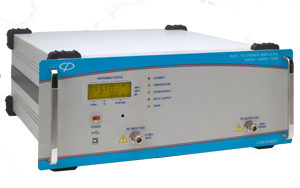 It is the perfect amplifier solution for IEC 61000-4-6 Conducted Immunity testing (150 kHz to 80 MHz), complementing Com-Power's full line of Coupling/Decoupling Networks (CDN's) and related test and calibration accessories. With its 50 dB gain, 100 Watt nominal power output, it easily achieves 3 Vrms or 10 Vrms test levels with any compliant coupling network (CDN, EM Clamp, Injection Probe, etc.) The ACS-181 amplifier complies with all required technical specifications for IEC 61000-4-6 compliance testing, yet its low cost makes it affordable even as part of a pre-compliance testing solution. BRL Test is your EMC-EMI headquarters and Authorized Com-Power Distributer.